By Rory D. Sweeney, Amanda Durish Cook and Rich Heidorn Jr. The first round of filings in FERC’s “paper hearing” on revisions to the PJM capacity market showed wide disagreement over the best way to address the impact of out-of-market subsidies on clearing prices. Much of the debate in the dozens of filings focused on broadening the minimum offer price rule (MOPR) and modifying the fixed resource requirement (FRR), which were the basis of the hearing. But many stakeholders also proposed alternatives. FERC ordered the hearing June 29 after concluding that increasing state subsidies for renewable and nuclear power were suppressing capacity prices. 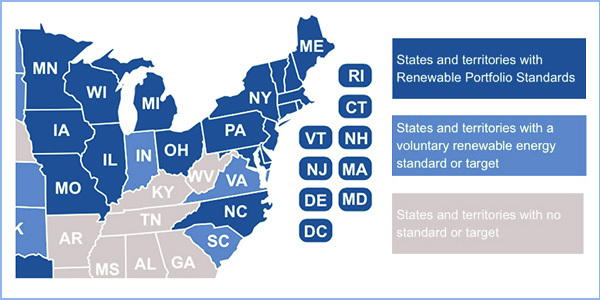 The commission’s 3-2 ruling required PJM to expand the MOPR to cover all new and existing capacity receiving out-of-market payments, including renewable energy credits (RECs) and zero-emission credits (ZECs) for nuclear plants. The MOPR currently covers only new gas-fired units. It noted that the Organization of PJM States Inc. (OPSI) supported development of the idea. The Electric Power Supply Association said the commission should prioritize protecting the capacity market from price suppression over accommodating state policies. It said the FRR Alternative would “effectively nullify” an expanded MOPR and could lead to the unraveling of the market. “The FRR Alternative will actively push states towards the path of partial reregulation by letting them choose to be part in and part out of the [capacity] construct and, more importantly, away from reliance on competitive, organized markets,” EPSA said. It said the order would allow a state “to play the capacity market hokey pokey, putting its left foot into the [Reliability Pricing Model] market and pulling its right foot out. A coalition of consumer advocates, environmentalists and industry stakeholders filed a joint brief arguing for prioritization of state interests. “We frequently disagree on many issues before this commission, and some of us even disagree on certain aspects of this proceeding, such as the circumstances that should trigger a minimum offer price rule,” said the group, which includes consumer advocates from D.C. and Illinois, the Sierra Club, Natural Resources Defense Council, PSEG Energy Resources & Trade, Talen Energy, Exelon and the Nuclear Energy Institute. “Integrating a carbon price into PJM’s markets would reduce or eliminate the need for states to address carbon emissions from the power sector in other ways,” the company said. 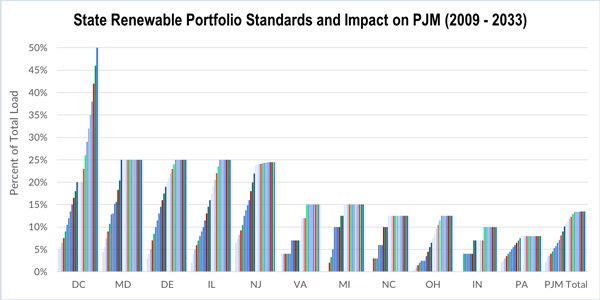 NGSA said PJM’s status quo would create an “untenable” environment where investment uncertainty erodes reliability and regulators pick winners and losers. “It is no easy task to achieve a balance that allows states to make their own procurement decisions, while still ensuring those decisions do not harm the wholesale markets in your jurisdiction. Despite considerable pressure to disregard actions that erode the integrity of PJM’s capacity market, the commission had the courage to say, ‘no more,’” NGSA CEO Dena Wiggins wrote. The American Coalition for Clean Coal Electricity and the National Mining Association also commended FERC on what they viewed as an effort to keep PJM’s market functioning through an expanded MOPR applied to all subsidies. However, the groups asked for an exception to the MOPR: an exemption on a possible fuel security valuation in the PJM capacity market. They said a new MOPR shouldn’t “counteract federal efforts to ensure grid resilience and promote national security.” The groups urged FERC to require PJM to create a separate capacity auction for resources that can guarantee fuel security for a minimum number of days. PJM’s “current market design is contributing to the loss of fuel-secure electricity resources, while encouraging reliance on pipeline-dependent and intermittent resources,” ACCCE and NMA said. EPSA countered that any federal price supports for nuclear and coal units should subject them to the MOPR. UCS argued PJM’s fleet of existing resources with state-sponsored out-of-market payments is “substantial” and greater in number than PJM has characterized. “If the fundamental principles presented by both PJM and the commission are as important as suggested, and the commission has found that any price suppression due to out-of-market payments makes the PJM capacity auction results unjust and unreasonable, then there cannot be MOPR exemptions for investor-owned plants that have been receiving cost-recovery through state-administered rates,” UCS wrote. It also said PJM did not collect the list of states with out-of-market revenues for investor-owned generation through either a renewable portfolio standard, zero-emission credit program or regulated cost-of-service. “All of the states in PJM have one or more of these mechanisms that provide the means for generation to either enter or remain viable in PJM’s capacity market,” UCS said. UCS said the fact that PJM’s Tariff allows zero-priced offers is evidence of state-supported cost recovery to keep resources viable in the capacity market. The American Public Power Association went for a scorched-earth approach, challenging PJM’s RPM itself. APPA also argued self-supply resources used to meet the load of public power and cooperative utilities should not fall under an expanded MOPR, arguing vertical integration and tax-exempt financing do not constitute out-of-market support. PJM’s Independent Market Monitor also suggested re-envisioning the RTO’s structure with what it calls a “sustainable market rule” that it argues is simple enough to be implemented in time for the next Base Residual Auction. While the Monitor attempted to differentiate its proposal from a MOPR, it would require all resources to offer into the BRA at their avoidable cost rate (ACR). The Monitor acknowledged that load-side fears might be realized with this approach, but that “the possibility that customers may pay twice has been accepted by the courts” and FERC. Vistra Energy and Dynegy Marketing and Trade proposed the Capacity Performance with Sponsored Supply (CaPSS), which it said is based on ISO-NE’s FERC-approved Competitive Auctions with Sponsored Policy Resources (CASPR) structure. The two-stage auction would require all resources to offer in at their going-forward costs. PJM would create a table of resource-type ACRs, and any resource that believes its going-forward costs are below its applicable value in the RTO’s table would request a review to validate its argument. The second stage would be “purely voluntary” and allow existing resources that received a capacity obligation but are willing to permanently exit PJM’s markets to “give up” their obligations “in their entirety” to resources seeking subsidies that didn’t receive obligations in the first stage. FERC faces a daunting task of threading the needle between at least eight proposed options for the MOPR and numerous modifications on both its FRR concept and PJM’s carve-out. Reply briefs in the docket will be due Nov. 6. PJM on Friday filed its long-awaited Capacity Performance proposal with FERC, a two-docket, 1,275-page capacity market overhaul that it hopes will prevent a repeat of last January’s poor generator performance. A pair of requests PJM submitted to FERC to safeguard capacity for the 2015/16 delivery year drew a number of protests last week, many calling the filings premature.